Whey is the largest and highly nutritious by-product obtained during manufacturing of cheese, chhanna and paneer. For nutritive and economic utilization of whey, technology for carbonated lemon beverage was developed by optimizing the rate of addition of lemon juice i.e., 4.0%, 4.5%, 5.0% and 5.5% and sugar levels i.e., 8%, 10% and 12%. The average total solids (%), protein (%), ash (%), ascorbic acid (mg/100 g) and total soluble solids (%) content in whey beverage varied from 14.47 to 18.45, 0.46 to 0.49, 1.03 to 1.09, 7.19 to 14.68 and 15.00 to 18.83 respectively. The highest mean scores of 8.25, 8.16, 8.21, 8.20 and 8.29 in for consistency, flavour, sweetness/ tartness balance and overall acceptability were obtained with interaction effect of L2 × S2 (4.5% lemon juice and 10% sugar). Most acceptable carbonated lemon whey beverage had shelf life of 49 days at refrigerated temperature (7 ± 10°C). Whey is one of the major nutritious by-product obtained from the dairy industry producing cheese, chhana and paneer. Composition and characteristics of whey varies depending on the applied production technology and the type of end product . Whey contains about 50% of the nutrients originally present in milk, comprising milk sugar (lactose), serum proteins (whey proteins), minerals, a small amount of fat and most of the water soluble minor nutrients from milk (vitamins) . Whey is an excellent source of high biological value protein which is a complete, high quality protein with a rich amino acid profile. Whey contains many organic and inorganic components which can replace the much of the loss of electrolytes, vitamins, amino acids and other organic components . Conversion of whey into beverage is one of the most attractive avenues for utilizing whey for human consumption [4,5]. Beverages provide energy and water to digest food, regulate body temperature, prevent dehydration, quench thirst and remove psychological tensions . Whey beverages have been recognized as a genuine thirst quencher, light, refreshing, healthful and nutritious . Processing of whey to beverages began in the 1970, and one of the oldest whey beverages was Rivella from Switzerland. Then after various types of whey beverages has been developed, which are produced from native sweet or acid whey, deproteinized whey, fresh diluted whey, fermented whey or powdered whey . Approximately 75% of the world's population loses this ability at some point, while others can digest lactose into adulthood. Lactose hydrolyzation results in production of glucose and galactose - monosaccharides which are more soluble than lactose, thus in turn gives higher sweetness, better solubility and better absorption ability than lactose . A variety of whey beverages consisting of plain, carbonated, alcoholic, soy, and fruit have been successfully developed and marketed all over the world because they hold great potential for meaningful disposal of whey solids. The nutritive value of lemon lies in its high contents of acidity, ascorbic acids minerals, flavanoids and phenolics. Its nutrients, vitamins and flavanoids help to prevent unwanted damage to cell membranes and other structures of the body by neutralizing free radicals . Lemon fruits was evaluated for the preparation of some new products, viz juice concentrate, foam mat dried juice power, carbonated beverage, powdered appetizer and drink . Ginger is effective in the treatment of cough and cold. It has been used to treat intestinal infections, especially related with digestive problems . Carbonation increased the palatability of the whey drink and extended its shelf-life . Presently one of the most prospective trends in whey utilization is usage of lactose hydrolyzed whey in beverage manufacture. Whey based beverage/drink are very much useful for geriatrics because of maximum biological value and low calories. Utilization of whey in beverage production by blending whey with fruit juice has importance in our country to solve the problems of whey disposal, improve the techno-economic conditions as well as provide nutritional and refreshing beverage to the society. The paneer whey (0.2% fat, 0.50% protein, 4.8% lactose, 0.43% ash and 5.8% total solids) was obtained from paneer by coagulation of milk which was standardized (4.5% fat) [12,13]. The milk was brought from Anubhav Dairy of SMC College of Dairy Science, Anand. Enzyme Maxilact L 5000 (β-D-galactosidase) from yeast Kluyveromyces marxianus var. lactis, supplied by DSM Food Specialties, Denmark. Fine crystalline sugar obtained from the local market was used in the preparation of whey beverage. Lemons (kagzi variety) were provided by Bagayat farm of Horticulture Department, AAU, Anand. Fresh ginger (Zingiber officinale) was obtained from the local market was used in the preparation of whey beverage. Tata salt obtained from the local market of Anand. The preparation of beverage involved different processing steps (Figure 1), which includes filtration, separation, pasteurization (72°C/15 sec) and cooling (37°C). For lactose hydrolysis of whey, pH was adjusted to 6.6 using 1N KOH. Then hydrolysis was carried out by adding Maxilact L 5000 @ 0.3 ml/lit and incubated at 37°C for 4 h with intermediate stirring at an interval of 30 min . After incubation, inactivation of enzyme was carried out by heating it at 80°C/5 min. After cooling the enzyme inactivated lactose hydrolyzed defatted whey, different ingredients were added i.e., ginger juice, lemon juice, salt and sugar with continuous stirring. After addition of above ingredients it is pasteurized at 72°C/15 sec and cooled at room temperature. Again it is filtered and stored in refrigerated temperature until temperature reaches to <4°C. The beverage was filled in bottle (200 ml). Then carbonation of beverage was done by injecting CO2 at pressure of 15 psi in glass bottles. The crown corking of bottles was done immediately and then transferred to refrigerator (7 ± 1°C) until sensory evaluation. The fresh beverage samples were analyzed for different physico-chemical and sensory properties. Figure 1: Flow diagram for preparation of lactose hydrolyzed whey beverage. Whey and beverages were analyzed for fat , total solids by the standard procedure using Mojonnier Milk Tester, Model-D , total nitrogen was determined by semi-micro Kjeldahl method  using Kjel-plus digestion system (Model-KPS 006L, M/s. Pelican Instruments, Chennai) and Kjel-plus semi-automatic distillation system, ascorbic acid  and ash. The pH of fresh whey and beverages were determined using digital pH meter (Systronic Digital pH meter, Model 335, India) and acidity (BIS Handbook 1989). All beverage samples were subjected to sensory evaluation by trained judges for flavour, colour and appearance, consistency, sweetness/tartness balance and overall acceptability. The experimental samples were served to the judges at 7°C. The panelists were instructed to rate each sample on 9 point hedonic scale. Lactose hydrolyzed carbonated lemon whey beverage samples were analyzed for standard plate count , coliform count  and yeast and mold count  throughout the storage period at an interval of 7 days. The mean values generated from the analysis of duplicate samples of whey beverage in three replications (12 treatments) are subjected to statistical analysis using factorial completely randomized design (FCRD) as per Steel and Torrie  (Figure 1). The acid whey (paneer whey) after filtration through muslin cloth was pasteurized at 72°C for 15 sec and cooled to 37°C. The average chemical composition of the whey which was used in the study is presented in Table 1. Table 1. Composition of lactose hydrolyzed whey. Based on preliminary trials, ginger juice @ 1% and salt @ 0.6% were added as a flavour enhancer in whey beverage. The lactose hydrolyzed whey was added with four different levels of lemon juice (L) i.e., 4.0% (L1), 4.5% (L2), 5.0% (L3) and 5.5% (L4) and three level of sugar (S) i.e., 8% (S1), 10% (S2) and 12% (S3) on the basis of final product. The all lots of carbonated lemon whey beverage were prepared and studied for their effect on compositional, physico-chemical and sensory characteristic of whey beverage. The average total solids (%), protein (%), ash (%), ascorbic acid (mg/100g) and total soluble solids (%) content in whey beverage varied from 14.47 to 18.45, 0.46 to 0.49, 1.03 to 1.09, 7.19 to 14.68 and 15.00 to 18.83 respectively. The fat content in whey beverage was 0.05 in all treatments because separation of whey to remove fat was done. The pH and acidity (% C.A.) of whey beverage ranged from 3.99 to 4.25 and 0.66 to 0.83 respectively (Table 2). Table 2. Effect of lemon juice and sugar on composition of whey beverage. Note: Each observation is a mean ± SD of three replicate experiments (n=3). Addition of lemon juice decreased pH because lemon juice has pH of 2.62. Increased level of lemon juice showed increase in acidity of whey beverage. Ascorbic acid content was also found to be increase significantly (P<0.05) as the level of lemon juice increases. There is no significant effect on total solids, protein, fat and ash content of whey beverage. Sugar addition significantly (P<0.05) affects total solids, ash, ascorbic acid and acidity of whey beverage while it has non-significant effect on protein and pH of whey beverage. The interaction effect of lemon juice and sugar was found to be significant (P<0.05) in case of ascorbic acid and acidity of carbonated lemon whey beverage. There was no significant effect of interaction of lemon juice and sugar on total solids, protein, ash, total soluble solids, pH and acidity of whey beverage (Table 3). Table 3. Effect of lemon juice and sugar on physico-chemical properties of whey beverage. The average sensory score for colour and appearance, consistency, flavour, sweetness/tartness balance and overall acceptability scores of experimental whey beverage ranged between 7.71 to 8.25, 7.78 to 8.16, 7.41 to 8.21, 7.43 to 8.20 and 7.48 to 8.29 respectively (Table 4). Table 4. Effect of lemon juice and sugar addition on sensory characteristics of whey beverage. There was no significant effect of addition of lemon juice on colour and appearance score of whey beverage whereas significant effect (P<0.05) was observed in case of consistency, flavour, sweetness/tartness balance and overall acceptability score. The addition of sugar had significant (P<0.05) effect on overall acceptability score while non-significant effect on colour and appearance, consistency, flavour and sweetness/tartness balance score of whey beverage. The highest mean scores of 8.25, 8.16, 8.21, 8.20 and 8.29 in for consistency, flavour, sweetness/tartness balance and overall acceptability were obtained with interaction effect of L2 × S2 (4.5% lemon juice and 10% sugar). The carbonated lemon whey beverage was prepared by addition of 4.5% lemon juice, 10% sugar, 0.6% salt and 1% ginger juice. Carbonation was done at 15 psi for 15 sec. The whey beverage was manufactured as per flow chart given in Figure 1 with compositional, physic-chemical and sensory parameter as given in Tables 5-7. Table 5. Compositional properties of carbonated lemon whey beverage. Table 6. Physico-chemical properties of carbonated lemon whey beverage. Table 7. Sensory score of formulated carbonated lemon whey beverage. The carbonated lemon whey beverage was subjected to storage studies under refrigerated conditions (7 ± 1°C). The samples were monitored after every 7th day for changes in pH, acidity, ascorbic acid, microbial load (SPC, coliform count and yeast and mould count) and for sensory attributes. The fresh whey beverage had pH of 4.14. The pH of the beverages increases significantly (P<0.05) throughout the storage study at refrigerated temperature (7 ± 1°C). The acidity of beverage was 0.776 (% C.A.) when fresh. The acidity of beverage decreases significantly (P<0.05) during storage and reached a value of 0.560 (% C.A.) at the end of 56 days of storage at refrigerated temperature (7 ± 1°C). Fresh whey beverage had the ascorbic acid content of 12.39 mg/100 g product which decreased significantly (P<0.05) to 8.47 mg/100 g on 56 days of storage at refrigerated temperature (7 ± 1°C) (Table 8). Table 8. Changes inphysico-chemical properties and ascorbic acid content of carbonated lemon whey beverage during storage. There was no growth during first 21 days of storage. As the storage days increases from 21 days to 56 days the SPC increase to 1.21 log cfu/ml. As the storage period advanced, the SPC increased significantly after 21 days at each stage during storage (P<0.05). On the production day and up to 14 days of storage, the whey beverage showed no growth of yeast and mold. During the period of storage the yeast and mould count of whey beverage increased significantly (P<0.05) after 14 days and reached 2.67 cfu/ml on 56 days of storage. Whey beverage samples stored at refrigerated temperature were found to be free from coliform throughout the storage study (Table 9). Table 9. 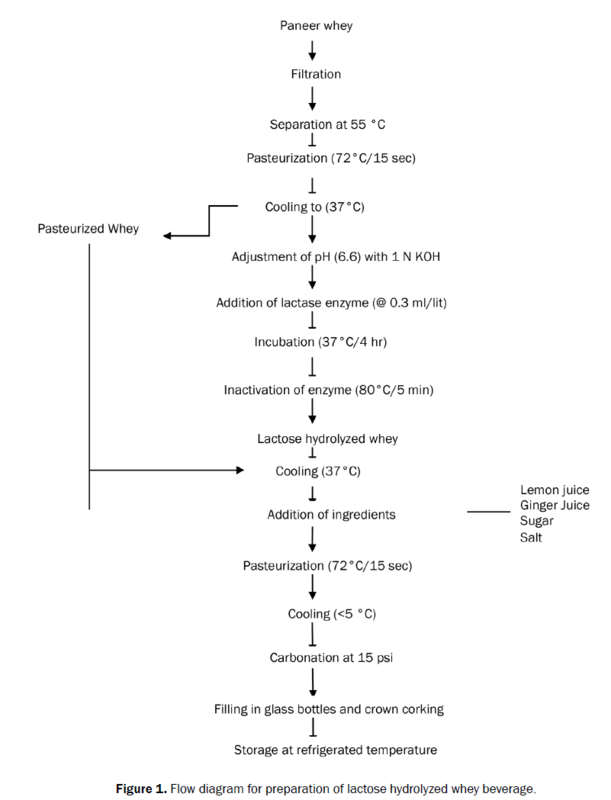 Changes in microbial qualities of carbonated lemon whey beverage during storage. The colour and appearance, consistency, flavour, sweetness/tartness balance and overall acceptability score of the whey beverage decreased significantly (P<0.05) from 8.10, 8.10, 8.29, 8.43 and 8.40 at 0 day to 5.43, 5.40, 5.07, 5.00 and 4.83 respectively at 56 days of refrigerated storage (7 ± 1°C). The product was acceptable up to 49 days of storage and became unacceptable at 56 days of storage refrigerated storage (7 ± 1°C) (Table 10). Table 10. Changes in sensory attributes of carbonated lemon whey beverage during storage. The consumer survey showed highly acceptance of beverage to different age groups i.e., >50 year, 36-50 year, 21-35 year and 15-20 year. The weighted average for different age group was calculated and from that average was calculated for each attribute which score 7.97, 8.08, 8.34, 8.20 and 8.38 for colour and appearance, consistency, flavour, sweetness/tartness balance and overall acceptability respectively. The comparative study was also carried out and experimental beverage was compared with a commercially available sample and both the samples were served to panel of judges. The sensory score for commercially available whey beverage and developed whey beverage were 7.50 and 7.92 for colour and appearance, 6.68 and 8.25 for consistency, 5.68 and 8.64 for flavour, 5.89 and 8.53 for sweetness/tartness balance and 5.53 and 8.58 for overall acceptability. Comparative to commercially available whey beverage, experimental whey beverage showed much higher acceptability on sensory score. The raw materials required for production of 1000 kg whey beverage were whey (7840.00 kg), sugar (100.00 kg), maxilact L 5000 enzyme (0.252 lit), lemon (120.00 kg), ginger (27.00 kg) and salt (6.00 kg). Thus, the total production cost of 1000 kg of whey beverage found to be 26672.60. The raw material cost constitutes 53.13% of production cost i.e., whey (12.59%), sugar (12.75%), enzyme (5.48%), lemon (17.99%), ginger (4.05%) and salt (0.27%). Packaging material and processing cost constitutes 37.87% and 9.00% of production cost, respectively. If this whey beverage is packed in 200ml sized PET bottle, the final cost of production was found to be 5.33 per bottle. The carbonated lemon whey beverage (with lactose hydrolysis) with acceptable quality can be prepared using lemon juice (4.5%), sugar (10%), ginger juice (1%) and salt (0.6%). The prepared whey beverage was acceptable up to 49 days at refrigerated temperature (7±1°C). The cost of whey beverage is 5.33 per 200 ml. The dairy industry, especially those engaged in the manufacture of cheese, casein, chhana and paneer can exploit this preparation as a value added product to minimize the waste disposal problems and generate income. Jelicic I, et al. Whey-based beverages: a new generation of dairy products. Mljekarstvo.2008;58:257-274. Meera B, et al. Production of single cell protein using Kluveromycesmarxianusisolated from paneer whey. Intl J Biomedical Adv Res.2014;5:225-257. Deepa CK and Krishnaprabha V. Development and nutrient, antioxidant and microbial analysis of muskmelon and whey water and probiotic incorporated squash. Int J CurrMicrobiol App Sci.2014;3:267-271. Nupur G and Gandhi DN. Comparative analysis of Indian paneer and cheese whey for electrolyte whey drink. World J Dairy Food Sci.2009;4:70-72. Sonali J and Geeta C. Studies on physicochemical and sensory characteristics of whey herbal-spice mixture. Int J Current Res.2014;6:7772-7775. Shaikh SY, et al. Studies on development of a process for preparation of fermented carbonated whey beverage. J Food Sci Technol.2001;38:519-521. Landge SN and Gaikwad SM. Studies on preparation and sensory evaluation of whey beverage. J Food Agrl Vet Sci.2013;3:27-29. Coton G. The utilization of permeates from the ultrafiltration of whey and skim milk. IDF Bulletin.1980;126:23-33. Sharma PC, et al. Preparation and evaluation of some value-added products from hill lemon (Citrus pseudolimon) fruits. Ind J Agrl Sci.2001;71:691-694. Adeshina GO, et al. Antibacterial activity of fresh juices of Allium cepaand Zingiberofficinaleagainst multidrug resistant bacteria. Int J Pharma Biosci.2011;2:289-295. Aysha S, et al. Effect of stabilizers on the quality of carbonated flavoured whey drink. African J Agri Res.2013;8:445-448. Pal MA andYadav PL. Effect of blending buffalo and cow milk on the physicochemical and sensory quality of paneer. Ind.J.Dairy Sci. 1991;44:324-332. Syed HM, et al.Studies on quality of paneer. J Food Sci Technol. 1992;29:117-118. Raval HB. Preparation of candy from lactose hydrolyzed whey. M. Tech Thesis submitted to SMC College, AAU, Anand. 2014. ISI Handbook of food analysis SP: 18 (Part VII: Spices and condiments). Bureau of Indian Standards. ManakBhavan, New Delhi, India. 1982. Laboratory Manual. Methods of Analysis of Milk and its Products. Milk Industry Foundation (3rdedn), Washington, USA. 1959;283. Jayaraman J. Laboratory Manual in Biochemistry, Wiley Eastern Ltd., New Delhi. 1981;75. Bureau of Indian Standards Handbook. Handbook of Food analysis, Dairy Products. Indian Standards Institution, ManakBhavan, New Delhi. 1989. Indian Standards, ISI: 5401-1969 Methods for detection and estimation of coliform bacteria in food stuffs. Indian Standards Institution, New Delhi, India. 1969. Indian Standards, ISI: 5402-1969 Methods for standard plate count of bacteria in food stuffs. Indian Standards Institution, New Delhi, India. 1969. Indian Standards, ISI: 5403-1969 Methods for yeast and mold count of food stuffs. Indian Standards Institution, New Delhi, India. 1969. Steel RGD and Torrie JH. Analysis of Variance I: The one-way classification In: Principles and Procedure of Statistics: A Biometrical Approach. McGraw Hill Kogakusha Ltd., Japan. 1980;137-167.